Been thinking about selling my 1993 ED 102 recently. I’m not in a hurry to sell it but if the right person with the right cash comes along then it will go. If not, it will go into some kind of storage for the late future. 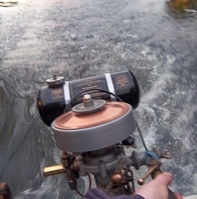 The motor ran very well and pumped well too, hasn’t ran since February 2018 but would run again easily. All it needs is a bit of gearbox leak work. I got as far as cutting the heads off the screws as they were seized but never got around to getting the cap off. I will not be giving a price for this, offers only. PM me if interested with a good offer. For those that don’t know, the ED engines were 102s made long after 102 production had officially ended. It is thought they were made to use up up old spares stock. Quite a desirable engine to have! Yeah i do really like it, its just not getting the attention it needs from me.